When I read that the Aurora Picture Show was moving over to 2442 Bartlett St. behind the Deborah Colton Gallery, my first thought was that whatever improvement this new space provided for the Aurora Picture Show, the real winner was Deborah Colton Gallery. The reason for this is that instead of one visual arts destination in that spot, there are now two. And that means that when people come to check out one of the venues, they have the opportunity to simultaneously check out the second venue. Now this doesn't easily work in the case of Deborah Colton Gallery and the Aurora Picture Show because Aurora is about showing movies--time based artworks with specific starting times. You can't just wander into the Aurora picture show the same way you can a museum or art gallery. Anyway, my gut feeling is that when you have visual art institutions (public or private) within sight of other art institutions, you can get this cluster effect. I define a cluster of at least two art spaces, within sight of and walking distance of one another. Visiting an art gallery or museum generally requires someone drive (or bike) to it--to make a dedicated trip, in other words. But if there is a second gallery there, the marginal effort required to visit the second art space is practically nil. Might as well, right? Consequently, it seems to me that clustering is always good, all other things being equal. There's a reason that so many galleries in New York City are right next to each other on a small number of parallel streets in Chelsea. 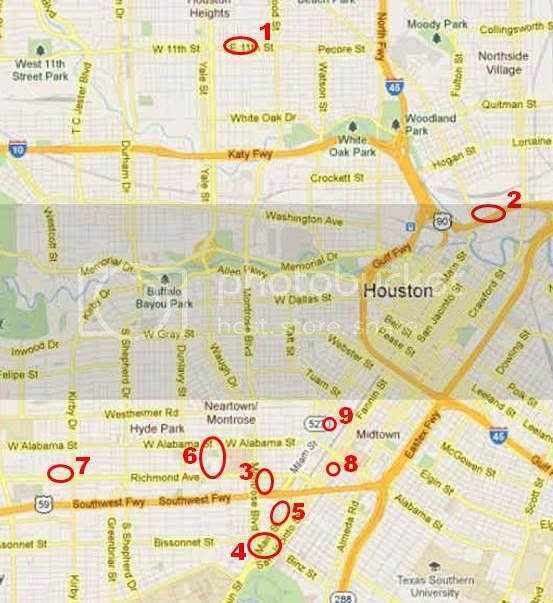 Here's a map of some clusters in Houston. 7. The Colquitt galleries--Goldesberry Gallery, Hooks-Epstein Gallery, Peveto, John Cleary Gallery, McMurtrey Gallery, d m allison art, Moody Gallery, etc. I like that when I make the rounds, I can see more than one exhibit at any one of these clusters. But the question I have is, does clustering actually help? This is the kind of question that a solid urbanist armed with the history of gallery openings and closings in Houston could probably answer statistically. Maybe I'll delve into that someday. I will say that since I started this blog, none of the institutions in clusters have shut their doors except for Joan Wich's gallery, which died when she did. But isolated, non-clustered institutions have had problems. Apama Mackey Gallery shut down and the New World Museum seems to be sputtering along. (Both of these still exist on varying levels--in the world of galleries and art spaces, life and death are not binary terms.) That said, Hiram Butler Gallery is still thriving in its weird (but beautiful) out-of-the-way location. Box 13 and the Pearl Fincher Museum seem to be making a go of it without any art neighbors. There are probably some rules for clusters. The visual arts spaces can't be too dissimilar, for example. You can't expect to have synergies if you put a cutting edge art space next to a gallery specializing in paintings of bluebonnets. Or a poster shop next to a blue chip art gallery. And there has to be a minimal amount of coordination. If one gallery has an opening and the rest of the galleries are closed, they don't get any cluster benefits at that moment. You just drew the map for a non-existent art guide to Houston. Somebody get on that. Don't they print something like this every summer? ArtHouston? It's sort of one big blast before everyhting slows down for the summer.